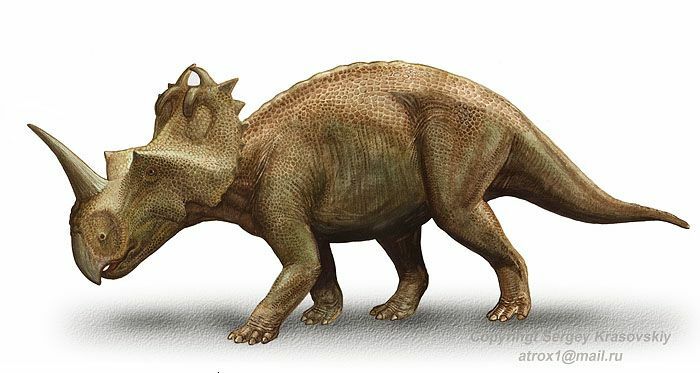 Centrosaurus acquired its named from the numerous bony projections that run along the edges of its frill.‭ ‬Aside from these a large nasal horn extends upwards from the top of the snout,‭ ‬and a pair of small horns project from the eyebrow.‭ ‬Two more hornlets hook down from the top of the frill,‭ ‬although how developed they are depends upon the species,‭ ‬being most pronounced in C.‭ ‬apertus.‭ ‬The nasal horn is also known to curve either forwards or backwards,‭ ‬and may be indicative of species. 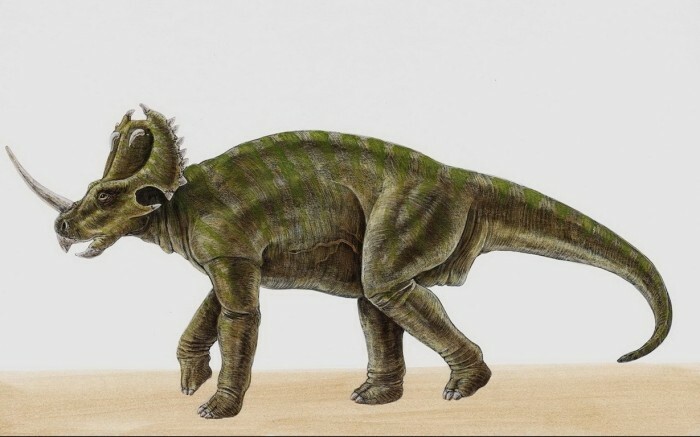 Even though it was not large for a ceratopsian,‭ ‬Centrosaurus was not small either.‭ ‬Remains of numerous individuals including the remains of several hundred dinosaurs in a bone bed indicate that Centrosaurus was one of the most common dinosaurs of the time and location,‭ ‬and may have moved around in herds numbering hundreds of individuals.‭ ‬However,‭ ‬the herding theory is but one interpretation of the site ait may also indicate a doomed watering hole that vanished during a drought.‭ ‬Study of the bone bed has also revealed Styracosaurus remains on top of the Centrosaurus remains,‭ ‬leaving some to believe that Styracosaurus may have displaced Centrosaurus as the main herbivore of the area. 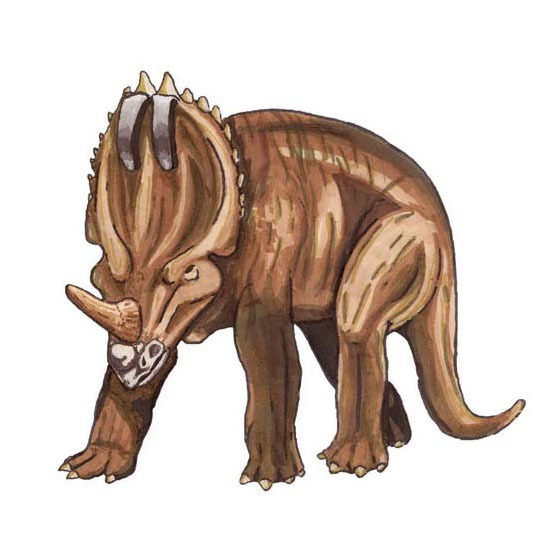 Centrosaurus has been used as the base of the ceratopsian group centrosaurinae.‭ ‬The ceratopsian dinosaurs of this group are noted for having short neck frills and single nasal horn,‭ ‬although some members do have brow horns,‭ ‬as well as further spikes that can and often do extend from the edges of the frill.‭ ‬Other ceratopsains of the centrosaurinae include Einiosaurus,‭ ‬Styracosaurus,‭ ‬Diabloceratops and Pachyrhinosaurus among others. 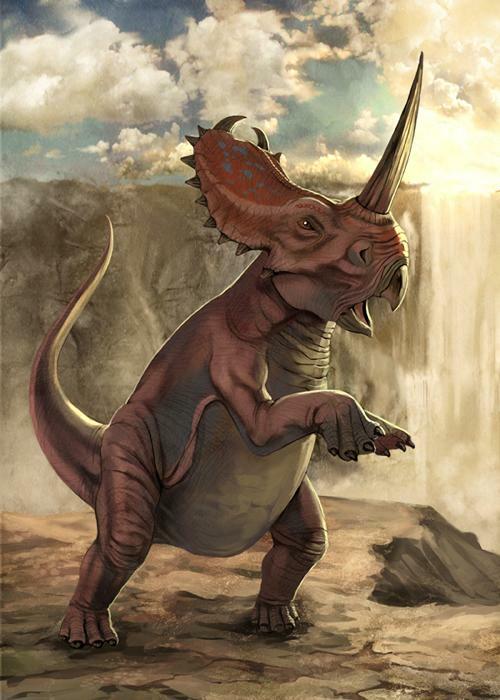 Centrosaurus was also at the centre of a naming controversy in‭ ‬1915‭ ‬with the discovery and naming of the stegosaurid Kentrosaurus.‭ ‬Although alternative names for Kentrosaurus were created,‭ ‬they were not needed as it was still spelled differently to Centrosaurus.‭ ‬On top of this they are also pronounced differently,‭ ‬Kentrosaurus with a kicking‭ ‘‬K‭’‬,‭ ‬and Centrosaurus with a soft‭ ‘‬C‭’ ‬pronounced as‭ ‘‬See‭’‬.